When quadruple amputee and retired Marine Sgt. John Peck looks down at his new arms, he said, he’s overcome with gratitude — and vows that he will not take them for granted. Peck soon will be able to use his arms to open heavy doors with circular handles, shake the hands of others and feel fiancée Jessica Paker’s palm in his. “That truly is a precious gift,” Peck said, with a cross around his neck and tears in his eyes, at anews conference at Brigham and Women’s Hospital in Boston on Wednesday. 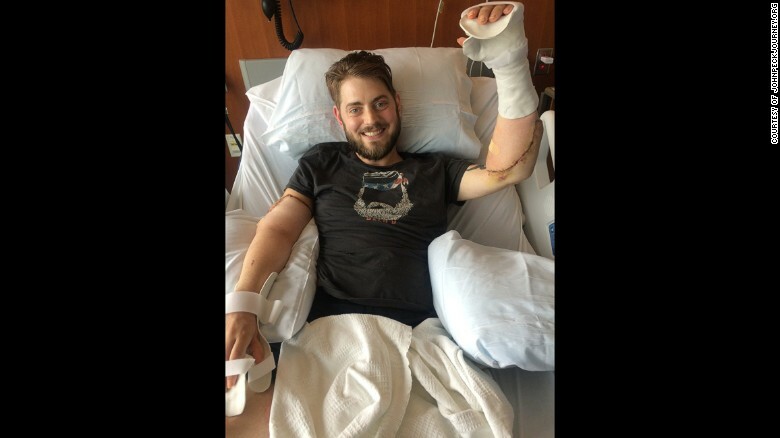 The 31-year-old wounded veteran underwent a bilateral arm transplant at the hospital in August. A donor’s two arms were surgically connected to Peck’s body near his elbows, which doctors say will allow him to eventually feel, grasp and hold in a way that prosthetics couldn’t. Peck’s life completely changed in 2010. During his second tour of duty, he stepped on an improvised explosive device in Afghanistan, which triggered a blast that caused him to lose his arms and legs. That wasn’t the first time Peck was injured. He’d previously served a tour in Iraq, where he suffered a traumatic brain injury. He’s the recipient of two Purple Hearts.